My son and I decided to stop by Amici in Greenhills today to buy some ice cream and pasta. He had just completed the last of his extractions prior to having his braces installed. My mind drifted back to 30 or so years ago when my own dad took me to the dentist and would patiently accompany me month after month at the orthodontist in Greenhills in the early 1980s. Things we do for our children sometimes trigger memories of our own childhood and what our own parents used to do for us. The time invested in us by our parents always create dividends of wonderful memories for us long after they have gone. 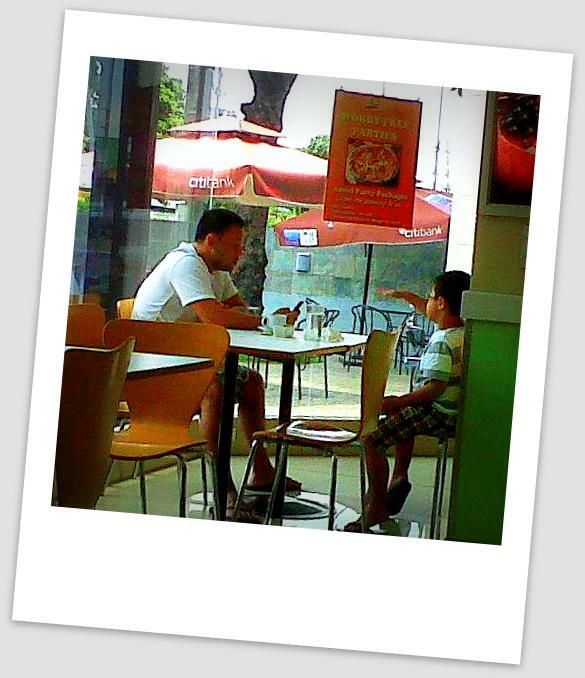 L and I were seated at a table when my gaze fell on this father and son. Although I’m not a mamarazzi, I could not help but snap this picture because it was such a beautiful sight to behold on a Saturday morning. Seated by the window, I watched father and son completely lost in each other, the dad fully in the moment and listening to his son tell his stories animatedly. It was a lovely morning as the sunlight gently fell on their happy faces. There was a moment when the dad showed something on his iphone to the little boy, and the boy lovingly placed his arm around his dad’s neck. I thought my heart was going to burst at that point. As my own son ate his ice cream to soothe the pain from his tooth extraction, I sat quietly with a smile on my face watching this father and son bond, fully engaged, and oblivious of everything and everyone. How blessed this young boy is, I thought to myself. To have a father who is attentive and very much engaged and involved in your life, whether you are male or female is truly a blessing. Although I had mine for only 16 years, and my brother had him for 10, he left us with a well of memories so deep and so meaningful, that we are able to draw from that well many decades later. As a young girl growing up, my dad would take my brother and I to his Makati office every Saturday. We would leave at noon and head for the old Sulo hotel in Makati for barbecue with java rice and a butterscotch sundae, or to the Jeepney coffeeshop at the Intercon for Indonesian sate. After lunch, we would hie off to the different bookstores in the area — Alemar’s by the old Rizal theater, PECO, Erehwon and buy the latest Nancy Drew mystery to add to my collection. It was my father who taught me how to read at the age of two. He would sit me on his lap and we would listen to Danny Kaye read Aesop’s fables while flipping through a book. A businessman with an English major, it was he who would also check my early essays and taught me how to write. I hope that one day, my children will also be able to draw from their own wells, long after I am gone and that they will have many memories to share with their own children about their moments with mom. Having lost my father early in life, I couldn’t help but think of all the young boys and girls who did not have the benefit of growing up with a father either by choice or circumstance. In such scenarios, the parent left behind needs to fill such large shoes. One can never be both mom and dad, but I take heart in remembering that Barack Obama, one of the most loved and influential persons in recent history was himself raised by a single mom (and loving grandparents ) and he turned out pretty well 🙂 Children in transition are an interesting lot, having been there myself, I can tell you that it’s a pretty tough road to navigate and the love and care of a consistent parental figure, with the support of other equally loving caregivers, can make all the difference in that child’s life.